Home › Prayer › How should we pray for ISIS? You can find out more about J John and his work through his website and also follow him on Twitter. My son asked me last week, ‘How should we pray for ISIS?’A good question and one that needed pondering for a few days! It is hard not to feel very strongly about the rise of ISIS in the Middle East and the brutal and very public barbarities it has carried out. This all raises many questions for the Christian. How should we respond? And what should we pray: ‘Lord, destroy them!’ or ‘Lord, forgive them!’? There is no doubt that some sort of intelligent military action is necessary. This is a merciless organisation whose destruction of Christian and other communities in the Middle East tells us that it cannot be allowed to continue. Yet there are real dangers for us all here. The first danger is that we adopt an arrogant self-righteousness. 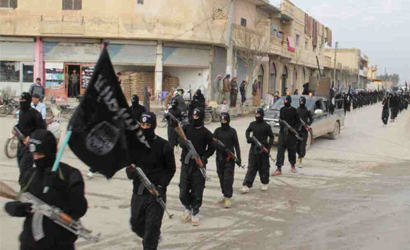 The meteoric rise of ISIS – or whatever it calls itself now – is actually no unexpected wonder. It draws its support from a widespread dislike and contempt for the unjust and corrupt political systems that have long dominated the region. Yet these are regimes that, despite knowing fully what they did, the West was very happy to support as long as they supplied us with oil, bought our goods and didn’t oppress our people. So in our praying we must admit at least some responsibility for the present state of affairs. A second danger lies in having a coldness of heart. In our praying and our actions we must be concerned for the many in the region, of every religion and of none, whose lives have been turned into tragedies by current events. We need to pray, ‘God have mercy!’, but as we do so let us also be prepared to be the answer to that prayer. The third danger is quite simply that of hating those who fight for ISIS. Let me suggest three reasons why this is wrong. The first is that we believe in a God who judges. We know that at the end of time the Lord will call all men and women to account before him for what we have done. Knowing that our enemies face such a prospect should transform any temptation to hate them into compassion. The second reason why hatred should be avoided is that we who are Christians are under orders not to hate but to bless. In the Bible we read this: ‘Do not repay evil with evil or insult with insult. On the contrary, repay evil with blessing, because to this you were called so that you may inherit a blessing’ (1 Peter 3:9). There is a profound psychological logic here. Hatred only breeds more hatred in response; in contrast, grace and forgiveness can end it. Let’s have the courage to pray that these people might encounter the true and living God and abandon their evil deeds. The third reason why I believe hatred must be shunned is not primarily theological but actually tactical. Something that the media has largely failed to understand is that the public and deliberately shocking nature of such acts as the beheadings of journalists and aid workers is a deliberate strategy to make us hate the perpetrators. Their goal is to create a situation in which Islam and the West find themselves in a bitter and bloody war. They want us to hate them, and I suggest that we are wise not to fall into that trap. Indeed, the greatest of all dangers is that the Christian Church so demonises the forces of radical Islam that our religion of grace and love is extinguished under the weight of wrath. Under such circumstances the Church would cease to be the Church. In a bitterly ironic triumph of evil we would have simply become the mirror image of our enemies. God has given the earth to man, Psalm 115:16, and wants us to do His will on earth as it is in heaven. The heart change is the most important, but if not then in the New Testament Govt, have 1 Peter 2:14 to follow as a minimum. Definitely ‘Amen’ to the canon’s closing prayer. His conclusion isn’t so much theologically sound as wise because, imo, it’s directly relevant to this brand of Sunni Islam’s end-time doctrine in hastening the end of the world by global conflagration. Great article but perhaps our most important response is guard against hate and fear of all Muslims taking root within us. It is scary how Isis drive cycles of hate between communities in the UK as well as Iraq. Perhaps one response is to follow Jesus teaching of loving those are different particularly within the Good Samaritan. Thank for your wise words. Love, not hate, is the response, but that still leaves questions about what our governments should be doing politically to counter the threat from ISIS and how best to protect people from persecution. With the greatest respect to J. John this article is far too simplistic and unbalanced. To blame Isis on “the political systems” is a mite naïve. Islam is committed to the destruction of Christianity and all those who love and follow the Lord Jesus. It was birthed in blood and spread by the sword. Yes we are to love our enemies, but are we to simply sit back and watch as terror runs riot. Just as well that didn’t happen in 1939 or Britain would have been under Hiltlers jackboot and many of us would never have seen the light of day. Amazing how such an intelligent and articulate man misses the key point. Lets ask ourselves an important but overlooked questions about all religions. If we look at the words and actions of the founder of all religions would this be a clear picture of the primary values and beliefs of that religion? I think so. So lets look at Jesus and see what he said and did and what his actions were. Did he ever, lie, decieve, injur, kill, or maim any person? Did he say that his followers should do these actions when he was no longer physically in their presence? No. Take a few minutes and think of any religion, that the founder actually did the following, kill, beheaded, maimed, lied and told his followers that they have the responsibility to lie and deceive as long as those actions were under the duties of Muslims in Jihad. These ISIS Sunni Muslims want an Islamic Caliphate and they will use all force within their power to obtain this vision if they are not stopped by military power the main goal is to kill them, not frustrate or annoy them. Islam is the reason for ISIS. Mohammed killed in battle, beheaded people, and maimed people. It is clear that you can see the spirit of Islam in Mohammed’s actions. I have prayed at the same time for the salvation of individuals within ISIS, and that military force would be used to stop them. These are not incongrous goals. Please Jay, don’t hide behind the politically correct smoke screen that we can say that Islam is a relgion of peace, it is not. Look athe life of Mohammed and read the Koran and see where the great majority of stife is in this world, where women are oppressed and only have half the value of a male testimony in a muslim court. This is wrong. Unbiblical and oppressive. The posture of this article sounds like it comes from the same mindset of Rochdale City Counselor. Girls were being abused by men and still are all over the country and some of these men are muslims. They were concerned about social cohesion and not wanting to draw attention to the muslim side of the story. What ever the belief system of the person involved it is factual, not made up. I am capable at the same time to call attention to the life of Mohammed and saying that it is a good thing that in this country we do put into pratice all that he did and commanded his followers to emulate. And not hating muslims and wishing them well in this country and making sure that they have every civil right afforded to every subject of the UK govt. The second half of the Koran is radically different from the first. Mohammed wrote it in the last part of his life, was far more belligerent, and really went against the spirit of what he had recorded in the earlier part. If you check the first part of the Koran, it speaks constantly of Allah [God] the All-Merciful, the Compassionate…” and we shouldn’t forget that, as this is what the vast majority of Moslems believe and that is the God they worship. It is slightly as if we condemn Christians on the grounds of the Old Testament; there were plenty of events there involving bloodshed, and punishment, etc But we stick with the Christ Jesus, and follow his teachings of love, compassion concern for the outcast, and social justice for all. We can read the whole Koran and see how the emphasis, message, tone shift to something entirely different. from the compassionate, all-merciful God who infuses the earlier part, through to the actions of Mohammed who had changed really depressingly in his old age. It is the God of love and mercy that the majority of Moslems worship and follow, just as we follow and worship the Christ. oh, I see you mean these peacfull Muslims that show children how to behead someone. Hope you experience the love and mercy flowing from this video. ‘Love the sinner, hate the sin’, we used to say. Can that be applied to radical islamists, too? We could equally easily point to the Crusades and denigrate the Christian message because the messengers were so appalling in their behaviour. That does not remove the message of love, peace, forgiveness, which is given to both Christians and Moslems. Pray for whoever or whatever you want. It doesn’t make a blind bit of difference to anything. Lavender you are right to point out that the earlier part of the Quran is more moderate but unfortunately many Muslims are taught that later verses supercede the early ones. Its right to separate the people from the teaching in terms of how we love and pray for muslims but concepts such as shirk , umma , taquiyya, dhimmi, jizya, fard-din, jihad, fatwa, mizan, kismat, muta, purdah, sharia, talaq, are all problematic for western democracies and contradict ideas of equal worth and liberty of the individual. The bible particularly the new testament teachings of Jesus have been influential in forming our culture. The word love appears over 600 times in the bible but less than 50 in the Quran (Even then rarely in terms of Allah loving humans or that humans should love one another ). There are Suras in the Quran which emphasise peace, mercy modesty and charity which are devoutly practiced by many muslims and on which the recent condemnation of ISIS by British Imams were based. We naturally do not want to see decent moderate Muslims targeted because of the actions of extremists. As Christians we are to love all people but also analyse and speak of the distinct differences between the two holy books . . .